Price is per long 34-inch strand of these beautiful black beads. Each size will be slightly different and shape, but largest average measures 6mm x 5mm x 3mm. Heavy! Hematite makes great jewelry because it's inexpensive and look shiny and sleek. People wear it as rings, bracelets and necklaces not only for style, but because they believe the magnetic variety relieves rheumatism. Magnetic therapy has been around for over 4,000 years. The idea is that a magnetic field can relax capillary walls in the body. This causes an increase in blood flow, similar to the effect of massaging your muscles, and stimulate the areas around the muscles to speed up healing. Others say, magnetic jewelry allows the body to produce endorphins, the natural pain killers. Hematite is one of the most common minerals, formed by oxidized iron. Although usually black in jewelry, it adds to the red color of garnet and ruby. All non-crystalline forms of hematite come from the mineral Limonite that lost water due to heat. Hence recent excitement of the discovery of grey hematite on the planet Mars - suggesting there was water once present. Only well-formed crystals are cut and polished into cabochons for jewelry, beads, and ornaments. Hematite comes from a Greek word for "blood-like" because of the color, and ancient superstition believed that hematite was formed from battles. Not all hematite is magnetic. Sometimes the magnetic attraction can be a disadvantage to jewelry design - pulling metal from other components. And there is a new type of hematite bead recently available giving yet another angle to this versatile metal - Aurora Borealis. This is hematite with an AB coating similarly used on crystals to give a multi-colored effect when turned. This looks striking on jewelry designed to be worn in bright lights at night. Hematite's properties come from the energy of iron and the calming of oxygen. It's a protective stone and its energy helps you connect with the Earth. Use during meditation to escape the illusionary chains of physical reality and become more connected to your true, spirit self - it's been used as an aid to astral projection. It also bolsters low self-esteem, making you feel more comfortable. Its grounding and soothing energies can help you relax and unwind both physically and mentally. Hematite is said to be closely tied to the blood due to its iron content. Believed to aid the kidneys, speed tissue regeneration, and contribute to improving the blood, and so the overall health of your entire body. 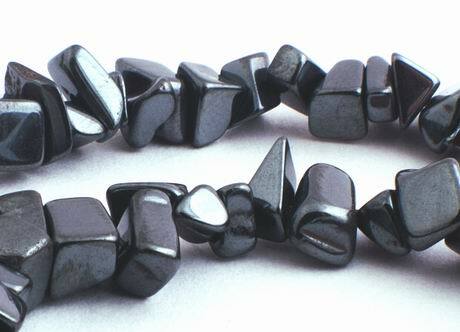 Hematite is a good choice for those born under the zodiac sign of Virgo.